The blooms on ‘Stairway to Heaven’ are periwinkle and pretty in mid-spring. ‘Stairway to Heaven’ has a neat form and doesn’t spread too much. Debbie Lonnee, the production manager at Bailey Nurseries in Newport, recommends a plant to try in each issue of Northern Gardener. 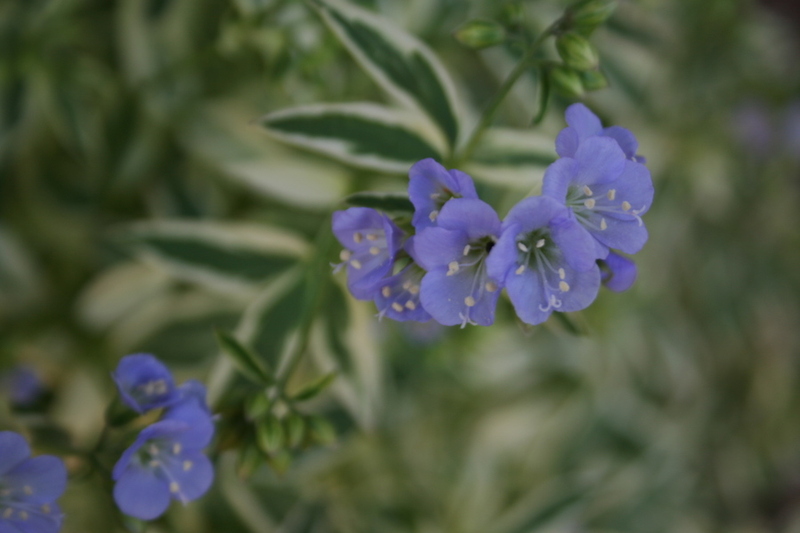 Many of her picks have made it into my garden, but my favorite by far is this variegated Jacob’s ladder (Polemonium reptans ‘Stairway to Heaven’). It’s in bloom now, and the blue flowers are delicate and pretty. 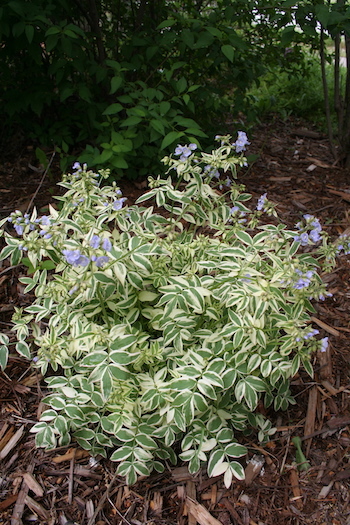 While it blooms only a few weeks a year, it looks great all summer because of the bright, variegated foliage. It does well in a part shade environment. Mine is planted almost underneath some lilacs and sumac in a back border. It gets some light when the sun is setting (that’s when I took these pictures) and also some at midday. It’s a hardy plant, too; I divided mine last year and now have two clumps of it doing well. ‘Stairway to Heaven’ was selected by William Cullina of the New England Wildflower Society, who noticed it growing in one of the society’s plant nurseries. He potted up the little plant with the creamy white border and the rest is plant history. I think I am going to have to try this one out .. my garden is becoming more of a shade garden every year .. so it is good to have a list of plants I don’t already have . A real plus is the variegation .. brightens up the shade area a treat ! Thanks !